Martha and I are still going strong in the tea cup department. I am going to apologize for the length of this post. but there is so much to share here, I allowed the length! The first cup I am featuring today was gifted to me by a very kind and artistic blogger who I met while I was with Marie Antoinette Mail Art Ning Group, Terri Gordon. I was thrilled to receive it! It really is a romantic cup! I love the flowers and the little raised dots around the base. Visit her blog at Terri Gordon Designs. Terri, but I am still thankful for your lovely gift! This was a well loved cup. Some of the pattern has been rubbed off with daily use. This may have been someones favorite tea cup to drink from! It has a sweet little rose on the back. 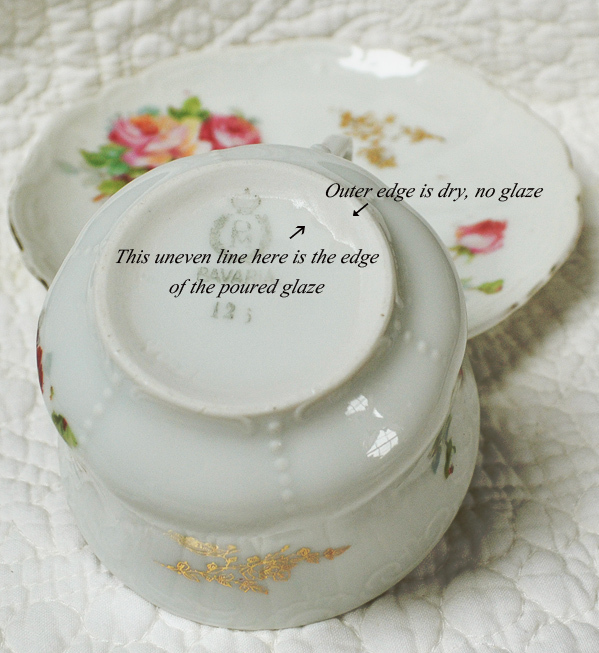 I find it fascinating to look at the backstamps of tea cups. some backstamps were actually stamped on. And this cup is a good example. It is definitely over the glazing. I also found the bottom of the cup fascinating for another reason. It goes all around, and looks to be the edge of poured glaze! I have not seen a cup like this before. It is not uniform, it is jagged. And the other arrow points to the area outside of the pool of glaze, and it is dry. A tiny bit of the backstamp is sticking out from under the glaze at one side. I have heard that if a cup says Bavaria it was created in the 20th century for the American Market, and if it was not, it said Bayerishe (German for Bavaria). If you have a cup with this name on it, then it was made in the 19th century. How unusual is it to see a glazing job on the bottom of a cup like this? Do any of you know the manufacturing process for this? I brought it home as it was the first cup I found that had two backstamps. It caused me to learn, so I thought it deserved a place in my home. 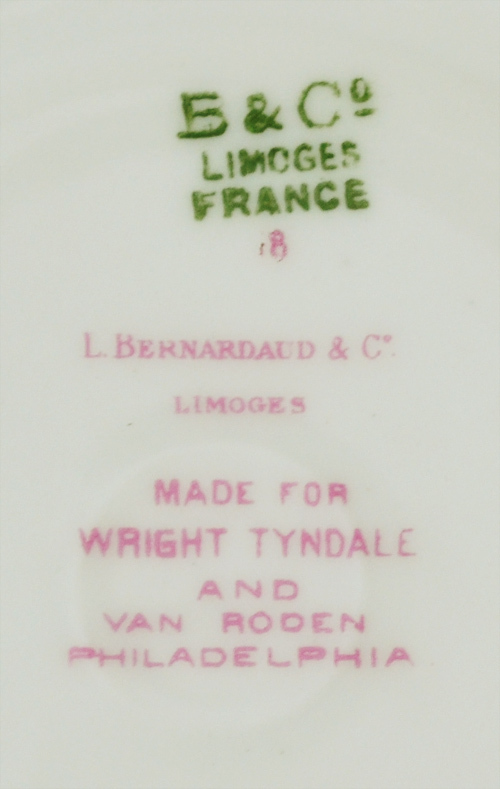 and one is the stamp for the store they created it for...Wright Tyndale and Van Roden in Philadelphia, and this stamp is under the glazing, where the manufacturer's stamp is under the glaze. This cup was given to me by my dear friend Cheryl in England. It had been in her family for many years. It too, has two backtamps. Hard to read on the cup! But the plate has a better view as the two backstamps do not overlay as much. Here you can see the word Lawleys stamped more clearly. 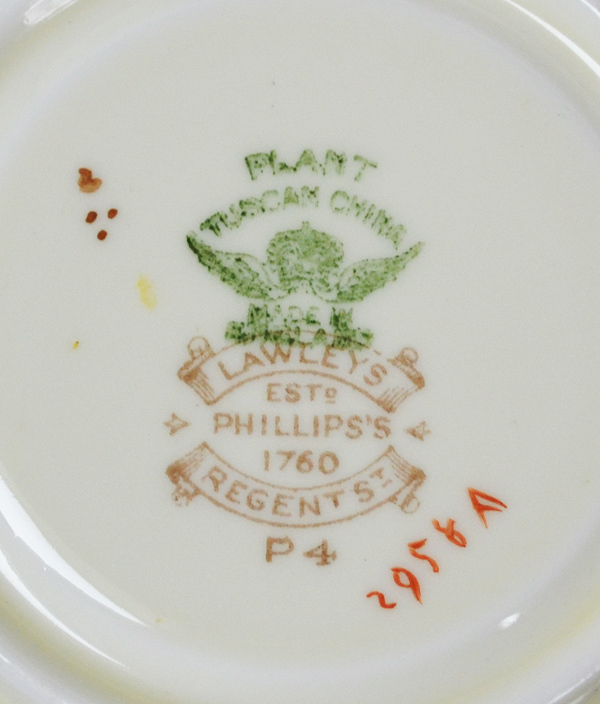 I found that Lawley's was a regent street retailer of fine china in London, years ago. This cup and saucer were made especially for this company to sell in their shop. Tuscan China (the green backstamp) is the actual manufacturer. There seems to be a Lawley's in Blackpool, Lancashire still. Do any of my English readers know of this shop? Do you remember them being open in London? One reason I adore tea cups is that I enjoy drinking tea! The two above are my current favorites from Tin Roof Teas. Worth every penny as it catches all the tiny pieces of herbs. Isn't it lovely that tea is beautiful as well as aromatic and delicious??? It is a feast for the eyes as well as the soul! Thank you all so very much for stopping by to visit! And I love to read your comments! Oh, what a gorgeous teacup from your friend from England. The prettier are from England..although I have lovely Bavarian ones too. Thank you for hosting yet, another great Tea Party. I have a setting for tea too, don't be dissapointed, as I love tea, I drink green tea all day long, lol..
rip van winkle blend..oh,love the name!! what's in it? my mother collected them also..they are packed away because we have little hands living with us!! I have never purchased loose tea like yours. I think it looks like potpourri. My teas are always in bags. Thanks for the backstamp series. 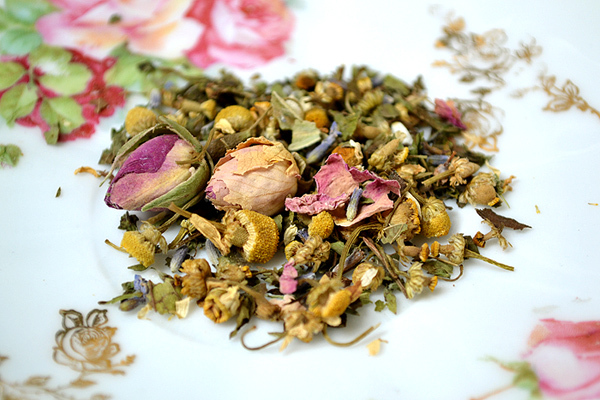 My favourite tea is always loose tea and you're right, it is lovely when you find rose buds and such wonderful ingredients in them. Some of them are so pretty and smell so delicious! Thank you for sharing another fascinating post. It's always a pleasure to visit you. By the way, I'm very happy you posted this early as there are four hours difference in our time zones. Hope you have a delightful week. 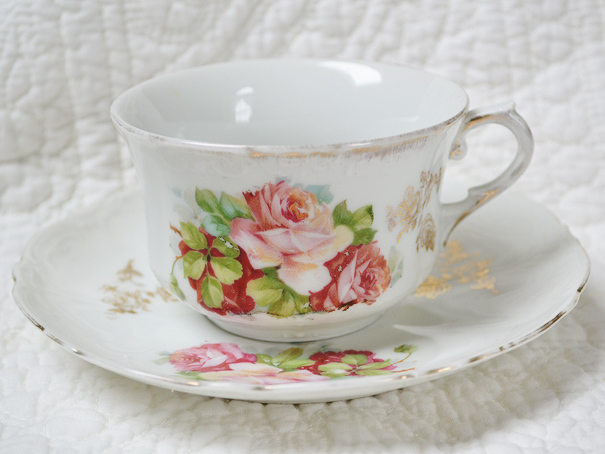 Hi Terri: Love the last tea cup, just stunning. 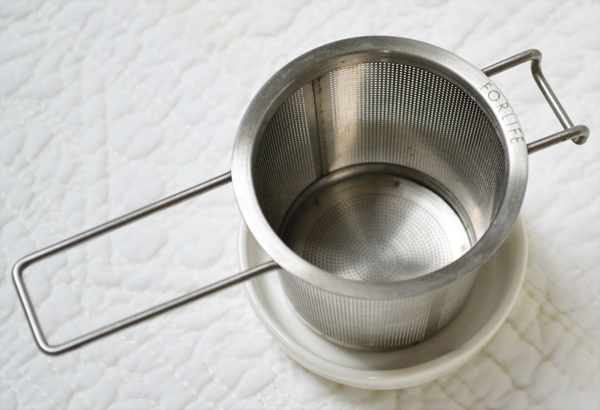 I have read everyone of your tea cup posts and I honestly do not remember seeing these cups. Thank you so much for re-runs. They are new to me and I love them! Have a great week dear friend. Hi Terri! Very fun! 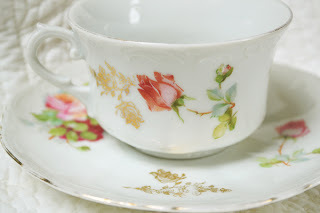 Lovely teacups...I always love Tuscan's hand painted on transfer art deco designs. Lawleys was a very important shop and only carried the finest china. It's always fun to find one with their backstamp! Thanks for hosting! Terri, how interesting! I absolutely LOVE the teacup from your wonderful friend, Cheryl, in England!! I've never seen one like it. I always love seeing your teacup collection, and ANY post of yours! Your tea is as pretty as the china cups. What a lovely blend that is. I like learning about the history of the cups, so this post about backstamps was really interesting to me. Your tea is as beautiful as your cups! How I love looking at china, especially vintage. My favourite is the last cup and saucer with the blue trees. I have never seen one like it before, it's stunning. 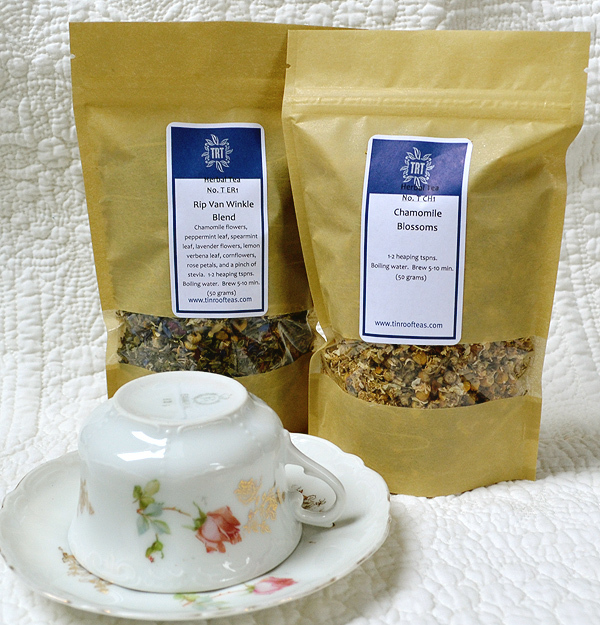 Love your pics of loose tea, they are gorgeous. I just bought some tea pearls, also known as tea flowers. Oh my, how delicious this whole post is! Your teacups are amazing and I learn something new with every post, your knowledge is incredible! 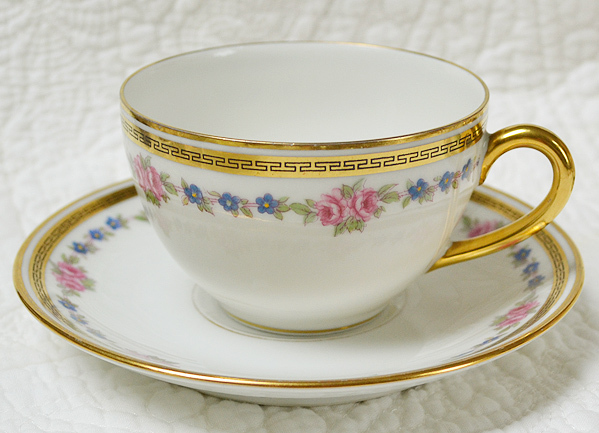 I adore the English teacup, the design is so beautiful, but all your cups are beautiful! Thanks Terri! I see your research is going on and you keep delighting us with beautiful cups and precious information. Glad you are including the backstamps and the history of each cup and saucer. I love your Bernardaud teacup and saucer for they design gorgeous china which I love to view at Neimans. 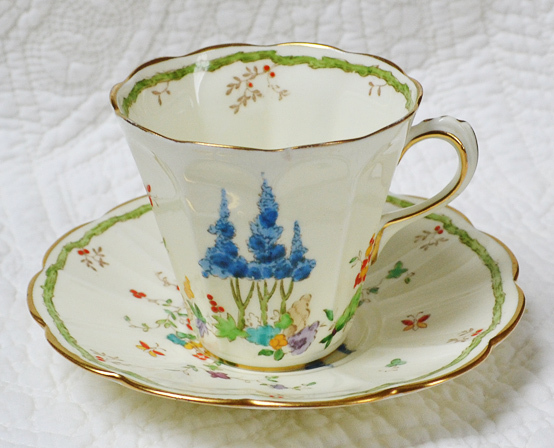 The Tuscan teacup and saucer appears to have some hand painting or enameling and the lovely shape makes it special. 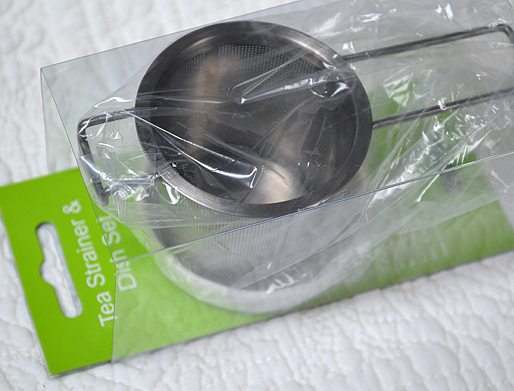 Thanks for sharing the tea strainer! Dear Terri, thank you for this additional, useful post. For the moment, I do not own any cup co-branded, but it's always good to see some examples. This week I was able to write a post and can participate fully in your Tea Party. your cups are all amazing and your informations are so welcomed. Thank you so much that you share this knowledge. There is so much to learn for me. Your tea photos are really a feast for the soul. Your Bavarian tea cup is made from Porzellanfabrik Moschendorf in Bavaria. You can find some interesting informations about the maker here: http://www.moschendorfer-porzellan.de/. oh gosh, you got beautiful teacups there that im so in love with them! how sweet of terri and cheryl, I just love both teacups! it would be interesting to know the answer of the unusual glazing job on the bottom of the teacup, thank you for sharing your wonderful collection and the photos are so lovely! I also so enjoy a beautiful tea, before water is poured over it, and yours looks lovely,with the colours and roses. Your cups are as alwayes ,very lovely,-and thankyou for your kind loving wishes- I wish you a beautiful day,too and all the best. I learned SO much in this post Terri. Thank you for sharing. Yay..Happy Tea Time Terri..Love your new strainer..I love collecting them..and recieved a new one for my b-day this year..it is shaped like a leaf!I love these gorgeous cups..very beautiful..and so wonderful to get a special gift to cherish from your friend..wow..fabulous! Love the shots of the loose tea and buds and leaves..divine!Yes a feast for the eyes..thanks again for another special post..i am dazzled as always! Tea cups are very lovely and I really enjoyed learning about the Backstamps. Lot of wonderful information. The teas look very hearty and I can almost smell them. The blends look wonderful. It made tea time very special. It's so interesting seeing your teacups. The poured glazed is so interesting. Beautiful cups as always! 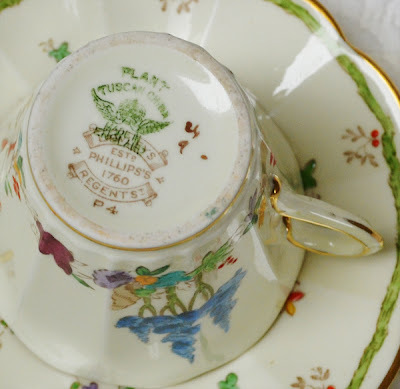 Beautiful teacups and such interesting information about backstamping. Thank you so much for sharing this with us. Thanks again Terri, I really have learned a great deal and appreciate your efforts to enlighten us. Love the tea...so pretty. I have really enjoyed your posts about backstamps as I have learned (or learnt?) a lot. Terri...that first little tea cup is so sweet, it makes me want to go out thrifting for some of my own! So soft, subtle...and oh so cute! Thanks for sharing your gorgeous post. Once again, thank you for your wealth of information. I'm finding your posts on back stamping very interesting. 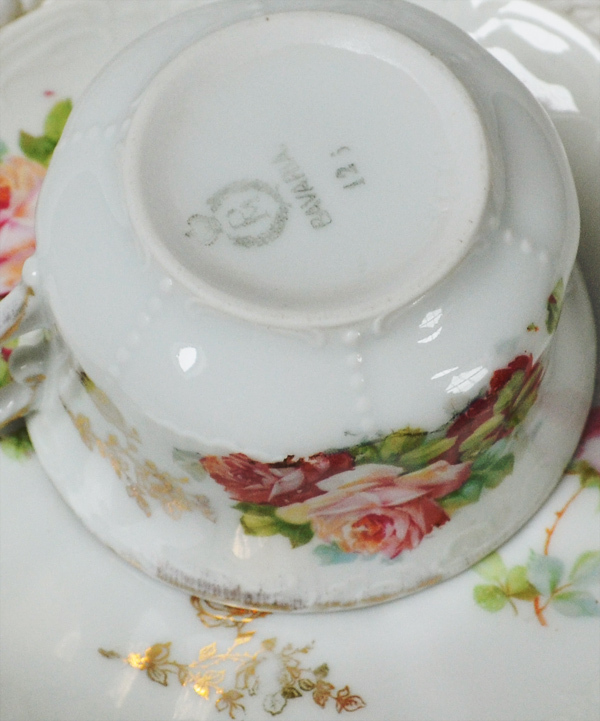 Quite obviously, even simple things like teacups have a story to tell! I love your choice of teas Terri. 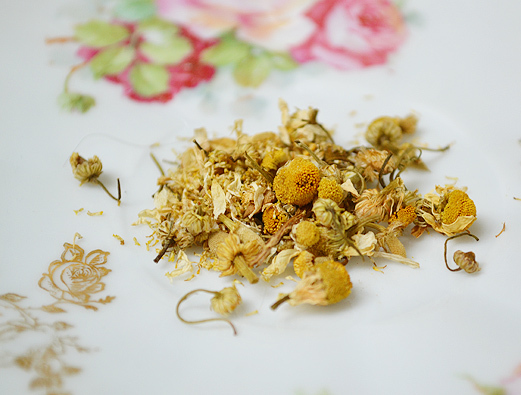 Chamomile is my tea of choice every night after dinner. For a treat...green tea with rose petals and for an extra special treat I add a teaspoon of rose water. Heavenly!